Dr. Joel Sabean, a prominent dermatologist from Falmouth, enters court in October 2015 with attorneys Jay McCloskey and Thimi R. Mina. 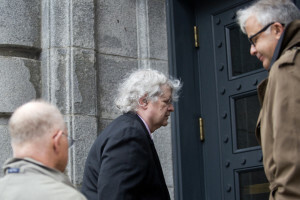 Sabean was back in court Tuesday for the start of his trial on charges of tax evasion, illegally distributing controlled substances and health care fraud. Dr. Joel Sabean of Falmouth, at center, walks into U.S. District Court in Portland Thursday, October 29, 2015 to face a 58-count indictment for charges including health care fraud. Flanking him are attorneys Jay Mccluskey and Thimi R. Mina.